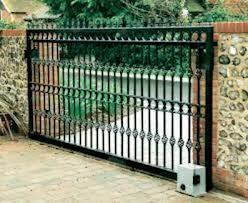 Automatic security gates can use photoelectric cells, or magic eyes, to detect movement. These devices operate in much the same way as hands-free faucets and home security systems. Photocells designed for use with automatic security gates are exceptionally precise and reliable, and they ensure that the gate will stop moving before hitting your car, a bicycle, or virtually anything else in the way. When using photocells for safety, you have two devices facing each other, with one on each side of the gates. The “magic eyes” of the photocells emit a light beam, and as long as nothing is in the way your automatic security gates will open and close normally. If you accidentally end up with your car in the path of the gates, the car would interrupt the beam of light. The photocell box registers that something is obstructing the path, and signals the gate to stop moving. Safety edges use strips that are attached to your gates, in the location where the gate would make contact with your car or objects. Not only are safety edges a sleek bumper for wrought iron gates, they also utilize special technology to send a signal to a control box. 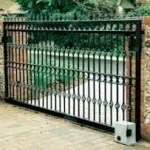 If the gates were to make contact with your car, the bumper itself would help prevent any potential harm. Then the wiring inside the safety edge would tell the automatic security gates to stop moving and reverse direction. This option provides exceptional safety and offers another solution for protecting your car from moving automatic security gates. To learn more about automatic security gates and other services from Titan Doors and Gates, call us today at 817-769-6565!